People generally visit casinos to get entertained and be relieved from their otherwise monotonous stressful lives. What better than the slot games which provide a player with a vacation like a feel? 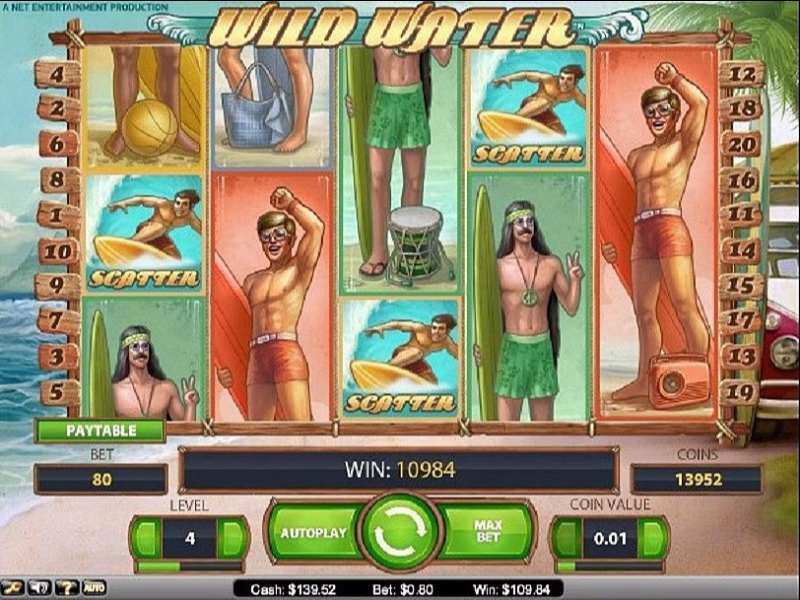 Yes, Wild Water online casino provides an exclusive fun and frolic experience through its stunning gameplay. The creators of Wild Water are none other than the popular UK developer NetEnt. This slot game lets the players challenge the mighty sea waves and offer them an opportunity to become a surfer. The theme of the game has been inspired by the 1960s era and looks absolutely magnificent allowing the players to engage in the surfing mode. The backdrop of the slot machine adds a retro look to the game which lets the players play this thrilling game racing against the waves. Wild Water slots have 5 reels and 20 pay lines and these pay lines can also be adjusted depending on the player’s will. One can select the bet level by adjusting the “Bet” section. Players can even adjust the coin size by adjusting the “Coin Value” and the “Max Bet” button lets the players hit the maximum bet. To let the reels to trigger, players need to hit the “Spin” button and off they go. There is also an option to let the spins roll uninterruptedly by selecting the “Autoplay” option for a certain number of times. The distinguishing feature of this slot machine is that the symbols are quite longer than the usual ones and few of them even occupy the entire reel. The prime symbol can easily be identified by the person wearing a red shorts holding a red surfboard occupying the entire reel. The second most important symbol is the girl wearing an orange swimsuit who is winking towards the screen. Other symbols include hippie guy in green shorts holding a green surfboard, a guy standing in the middle of a yellow ball and yellow surfboard, a lady in a blue bikini in front of a blue surfboard and a girl with a golden background. The dolphin acts as the wild symbol whereas the boy surfing on a golden surfboard is the scatter symbol. The wild symbol substitutes every symbol except the scatters symbol thus increasing the chances of the winning of more coins. This online slot game can be played entirely free of cost since there is no requirement to play it with real money. Any player can also play free Wild Water casino slot machine at the ease of their own houses. Wild Water is filled with several features and many bonus options which a player can take advantage of. The symbols are highly rewarding and the best part is that players stand a chance to win huge coins along with lots of free spins. The most prominent symbol of this slot machine is the red shorts wearing boy following which the swimsuit wearing girl. Other symbols already mentioned above give nice payouts too. The wild symbol in this slot game also boasts of top-notch winnings chances. Since the wild symbol has the capability to substitute all other featured symbols rather than the scatter one only. Surf Team Bonus – The player receives 200 times the bet at the maximum if all the surfer symbols land taking an entire reel. Surf’s Up Bonus – Similar to Surf Team Bonus, the surfing symbols must stack by taking the entire reel and the player can win 20 times the wagering amount. The players might also win a jackpot of 2000 coins whenever all the Golden Surfer symbols on the pay line. They are not asked to deposit any amount before the gambling begins so it’s quite understandable that the player feel much secured before the game begins. Overall this slot game is pretty cool to play since it gives the feel that you are surfing against the high waves now. It is one of the uncomplicated slot games to be understood and the players find it more enjoying since there is ‘no download’ option. The payouts from this slot game might be low but it is quite satisfactory whenever the player is trying. The free spins that the player has an urge to enjoy is one of the highlighting features too. One would get the privilege to play with these symbols and earn winning coins through them. 0 responses to "Wild Water Slot"